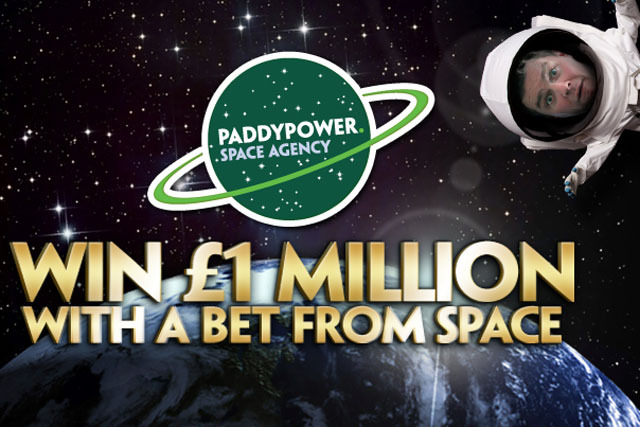 Paddy Power is celebrating reaching one million fans on Facebook with a competition that offers the winner the chance to place the first ever bet from space. The competition opens today and runs until Sunday 25 August on the bookmaker's Facebook page. A winner will have a bet placed on their behalf using a high altitude weather balloon. The helium-filled balloon will be attached to a Raspberry Pi low-tech computer, a modified GPS unit, an altitude sensor and a radio transmitter. When the balloon reaches 100,000 feet, the radio transmitter will automatically send a signal down to a ground station, where an accumulator will be placed on the weekend's Premier League matches. The signal places the bet using a web link to Paddy Power's secure web servers. If the bet pays off, it could be worth up to £1 million. Paddy Power has the largest social media presence in the UK betting industry. A spokesperson for the company said: "We have bets placed in lecture halls, on the toilet and at weddings everyday so what better way to celebrate reaching one million Facebook fans than to give one of our loyal customers the chance to become a millionaire by betting from the final frontier?"